The below mentioned recipe will be helpful to arrest coughing and improve breathing. It is very helpful during cold and flu infections. Several of the herbs have a numbing effect that is soothing to lung and throat pain. The soothing effects of this herbal mix are beyond imagination. It is as powerful as any cough syrup and faster acting. Moreover, this remedy has a therapeutic and anti oxidation effect overall, while the chemicals in commercial cough syrups impair the immune system. * Green tea is preferred, but regular tea can be used as an inferior substitute. Prepare this remedy by placing the tea bag and herbs into a sauce pan then add boiling water. Let them simmer for three minutes, then strain before adding the honey and lemon. Dry roast both these. 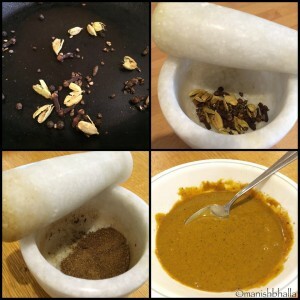 Cool, grind and mix in haldi and honey. Initially have 1tsp thrice a day and then twice. Avoid having anything for about an hour after taking this. Haldi is antiseptic, also helps in relieving congestion. Honey will coat the inside and help stop the coughing. *This mix can be stored in a clean glass jar on the counter at room temperature for as long as it lasts. Just make sure you always use a clean spoon to scoop it out.